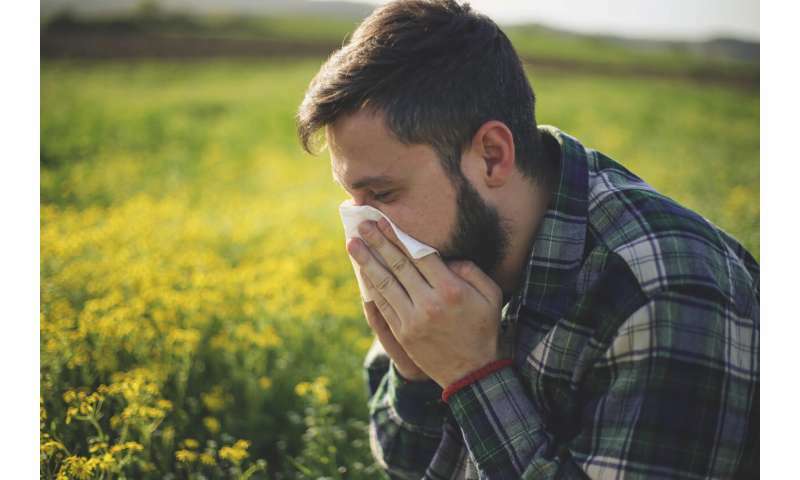 The presence of different strains of grass pollen in the atmosphere can help predict when hay fever and asthma could strike, a study involving a University of Queensland researcher has found. School of Public Health Associate Professor Nicholas Osborne said the collaborative study used plant DNA methods to identify and track different strains of pollen. "Using this method, we may be able to better predict when allergenic pollen is present and allow people affected by asthma, chronic obstructive pulmonary disease (COPD) and rhinitis to more effectively manage their condition," Dr. Osborne said. The research tracked grass pollen for seasonal variations and found it was released into the atmosphere later in areas further from the equator. "That tells us that that grass pollen exposure changes substantially across the allergy season," Dr. Osborne said. "With the advent of personalised medicine, more and more people are becoming aware of which allergen is responsible for their allergy." He said the research would help allergy sufferers prepare for the hay fever season and doctors to prescribe more personalised treatments. "People who fail to manage their asthma are at greater risk of asthma attack and being forced to visit hospital emergency departments," he said. "Having a more accurate forecast of when a patient is at risk will allow people to better manage their disease." Scientists hope to expand on the research to create a unique profile of each grass pollen species to determine the most harmful strains. "We hope to use this data to examine if particular grass species are more allergenic than others," Dr. Osborne said. "We are doing this by examining hospital and GP records in the United Kingdom and seeing if demand for these services involving asthma and rhinitis correlates with the presence of one grass species over another. "For example, ryegrass has been touted as the cause of thunderstorm asthma in Australia, as it occurred in Melbourne in 2016. "Eventually—possibly within three to four years—we hope this will allow us to produce a better forecast of when and where exposure to pollen occurs." The study is published in Nature Ecology and Evolution.